Mike Moss’ debut album is a bit of a surprise in just how polished and well-done it is. There’s none of the major missteps that often are found on freshman attempts, instead, listeners get 12 tracks, all of which are decent. 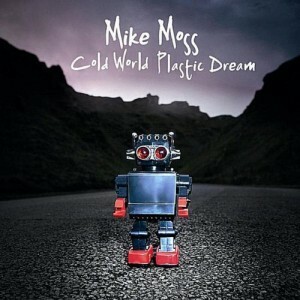 Sure, some are more notable than others, but Cold World Plastic Dream is a smart set of songs to display Moss’ talents to potential new fans. There are numerous places where listeners get hints of other artists throughout Cold World Plastic Dream and that’s immediately noticed on “It’s Time” with its tiny nods to Muse. This is not to say that “It’s Time” sounds 100% like something Muse would record, but there are just subtle similarities that one catches, particularly on the introduction. That said, the track doesn’t achieve the same intensity as most Muse songs, but is more comparable to a David Gray track (not exactly the Bowie-esque style that it’s advertised as). “Only Lies” falls more into ballad territory than most of the tracks, and while it gets a little close to sappy territory, it saves itself with some good piano melodies and an ability to pull back from that dangerous line just when it should. “Emotion Machine” doesn’t fare as well. It’s got a good beat and even the verses aren’t bad, but there’s something about the chorus that gets irritating, possibly the up and down nature of the melody, although the lyrics aren’t outstanding either; “I’m just a work in progress, a glorified emotion machine.” “Higher You Climb” fares much better, although it’s yet another area where those outside influences creep in. In this case, “Higher You Climb” is reminiscent of U2 in The Joshua Tree era. Not a bad thing, and it does have a slightly different flavor, but for some listeners it might just make them want to listen to U2 and not continue with Moss. The album is rounded out with two acoustic versions of songs earlier on the album, “Be the Way” and “Morning Call.” In the case of the former, the acoustic track sounds considerably more melancholic than the original, which isn’t necessarily a bad thing, but it’s an interesting shift. For “Morning Call” the similarities between the two tracks are much greater. Cold World Plastic Dream is a solid set of songs, but somehow doesn’t exactly achieve that sound that grabs listeners and won’t let go. It is well produced, has fine writing and no major missteps, but even mellow albums can still have that something that strikes listeners and makes them want to keep playing the album. Unfortunately, Cold World Plastic Dream doesn’t quite find that moment, which isn’t to say that Moss won’t ever achieve that, but it might not be on this album.